Enjoying a unique position in The Rocks between the Harbour Bridge and the Opera House, perfect for the shops, cafes and restaurants in The Rocks area. Occupying both historical and modern buildings, the hotel is a perfect blend of international elegance and old world charm, with the added benefit of stunning harbour views. 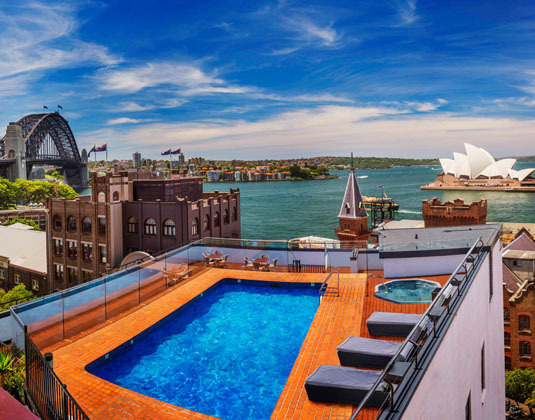 Perhaps the best place to enjoy the panoramic views of the beautiful harbour is from the rooftop pool - one of the best in Sydney! In standard rooms with air-conditioning, bath, fridge and safe. king superior rooms * executive rooms. FREE nights 4 for 3: Apr-Sep 19. FREE daily breakfast for two: 02 Jan-28 Dec 19 & 02 Jan-31 Mar 20 if you stay at least 3 nights. Family offer: Children 0-12 years eat free. Please ask for details.